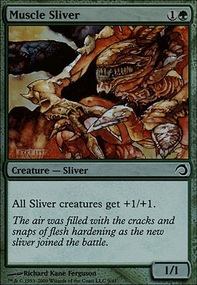 To what extent can Sliver Overlord respond to being targeted? 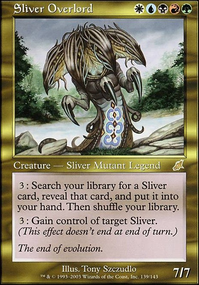 : Search your library for a Sliver card, reveal that card, and put it into your hand. Then shuffle your library. Hybrow on Ya ya ya! I am Lorde Tribal! 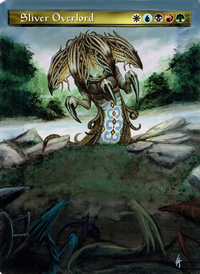 I built a changeling deck based on Sliver Overlord , cause i liked the ability to steal other peoples creatures with it and changling instances and such. But did add a bunch of lords into it. I would swap out Steamflogger Boss with something like Goblin Chieftain costs 1 less mana, and still gives all your guys haste. I dont think you are using contraptions, so seems a better fit. A good looking deck. Have you play tested it? 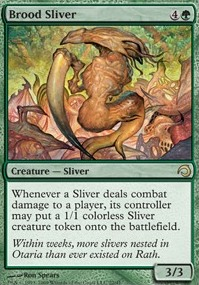 Loving the Amoeboid Changeling / Sliver Overlord combo. If you need help just search slivers and you will find a tonne of decks to inspire you. I needed the same help with my deck. This site helps a lot. If you like check mine out. It's not tribal but it works. 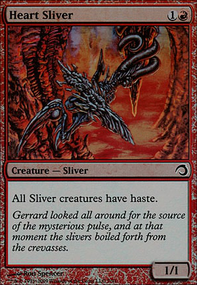 Sliver Overlord then tutor up Venom Sliver and Horned Sliver . 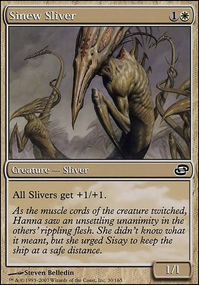 slivers have a lot of power buffing creatures like Sinew Sliver and Predatory Sliver to help ramp up that trample damage. 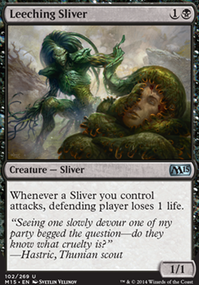 you also get Striking Sliver , which is really good with deathtouch. a 1/1 with first strike/deathtouch can safely block and kill a vanilla 10/10, for example. If you're looking at Esper, of course, Oloro, Ageless Asetic. If you're looking at blue-black, try Phenax, God of Deception because it's super fun to have your opponents mill the key cards in their deck. 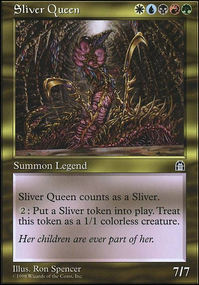 If you want to extend into green, definitely go for Arcades, the Strategist , and if you want an all-around awesome build (and are okay with being the #1 target at the table) then play slivers: Sliver Overlord , Sliver Hivelord , Sliver Legion , and Sliver Queen . 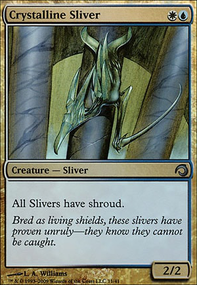 But right now I am thinking Sliver Overlord because he give me the ability to steal other peoples creatures with the use of Blades of Velis Vel , Shields of Velis Vel , Wings of Velis Vel and Amoeboid Changeling . 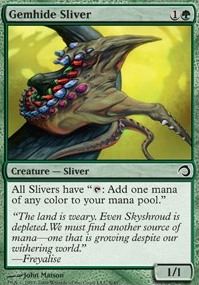 (change your Ulamog to a sliver and then take him for my own). Add the fact that he can also tutor any of those cards if someone has an especially dangerous guy on the field. 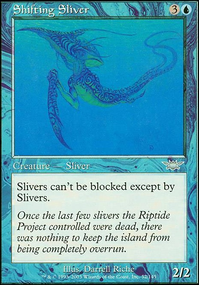 I love slivers but you need different ways to get them out of the graveyard. 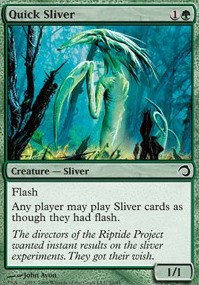 My sliver deck and every other sliver deck I have every played is very slow and is a massive target to every other player. I recommend Nissa, Vital Force , or a Grave Betrayal . 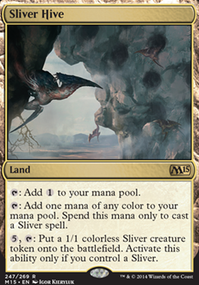 If you have your commander Cryptolith Rite is not a good card for this deck because you can tutor for two other cards with the same exact effect. 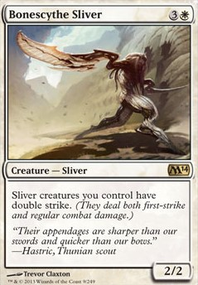 Winged Sliver is a little redundant you already have two other slivers with flying. 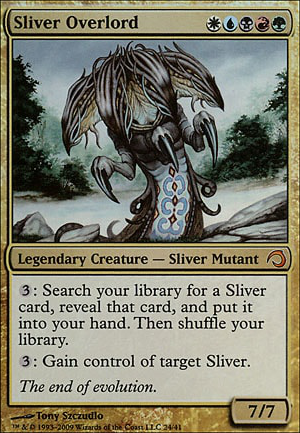 Thorncaster Sliver is very expensive and Leeching Sliver has almost the same effect.